Finns never fail to point out that the kantele is Finland’s national instrument. In our national epic, the Kalevala, Väinämöinen the wizard builds the first kantele from the jaw bone of a pike and charms all the people and the animals of the forest. But there are kantele-like instruments elsewhere too, and it is only recently that they have begun to be studied more thoroughly. The kantele is Finnish. As I think about this statement, it feels true. But is the kantele exclusively Finnish? After all, the statement could be construed to mean that. Many Finns do a double take when someone mentions a Russian kantele. How could the Russians possibly have a kantele? 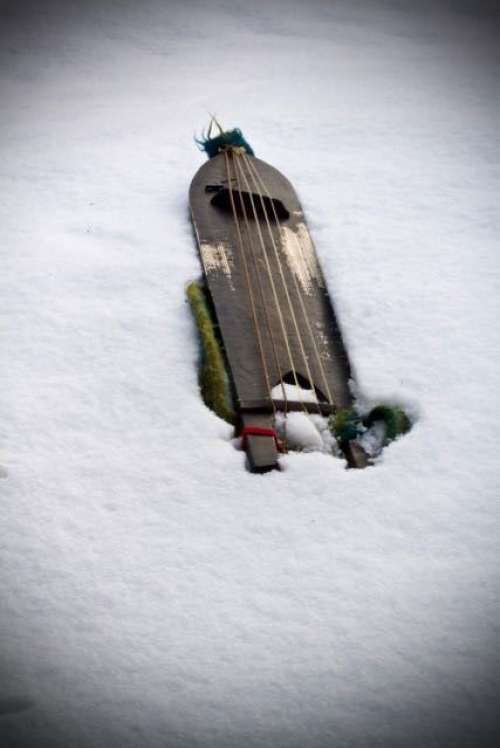 To be fair, the instrument is called the gusli in Russia. So we are back with the Kalevala. I ask Väänänen whether the other peoples with kantele-like instruments have a similarly strong bond between instrument and mythology, and he nods. Helmet-shaped gusli/zither. Photo: Timo Väänänen. The official status of kanteles varies from one country to another. In the Baltic states, these instruments (the kannel in Estonia, the kokles in Latvia and the kanklės in Lithuania) have a firm official status. Music played on them is a living tradition to this day, and there is training available. Väänänen makes particular reference to the thriving instrument-building tradition in Estonia. The kantele is a very popular instrument in Finland today. It is used in music playschool and of course for folk music, but classical music is also played on the kantele, and contemporary classical music has been written for the instrument. The kantele is equally adaptable to Michael Jackson and to basso continuo playing. However, it is still principally perceived as a folk instrument. “You can call it a folk instrument if you want to emphasise the historical or traditional aspect,” says Timo Väänänen. “It sort of pigeon-holes the instrument: it is specifically described as being traditional. What about just calling it an instrument? And then talking about the tradition as a separate thing?" The kantele family includes an exceptional number of instruments that are very different from one another. In Finland, the kantele has not been developed into an entire range of instruments for orchestral use as in Russia or Lithuania, for instance. The Finnish variants of the kantele – the five-string hollowed-out instrument, the 10-string and 15-string small kanteles, the Saarijärvi kantele, the home kantele, the concert kantele and the electric kantele – are very different from one another. Although this diversity is a strength, Timo Väänänen also considers it a good thing that not every individual instrument is of a unique design. In the 19th century, the kantele was firmly attached to the building of the Finnish national identity. This meant practically ignoring its use by minorities. Väänänen has studied several kanteles in museums in Finland and abroad and points out that even museum collections were originally assembled on the basis of the nationalist ideal. Museum instruments are frequently copied nowadays, and there is much to learn from them. Väänänen mentions an example: the groove on the reverse of the blade of a wing kantele is there for the purpose of projecting the sound. If it is omitted, the instrument will not work. This is the kind of know-how that can be rediscovered by close examination of instruments. 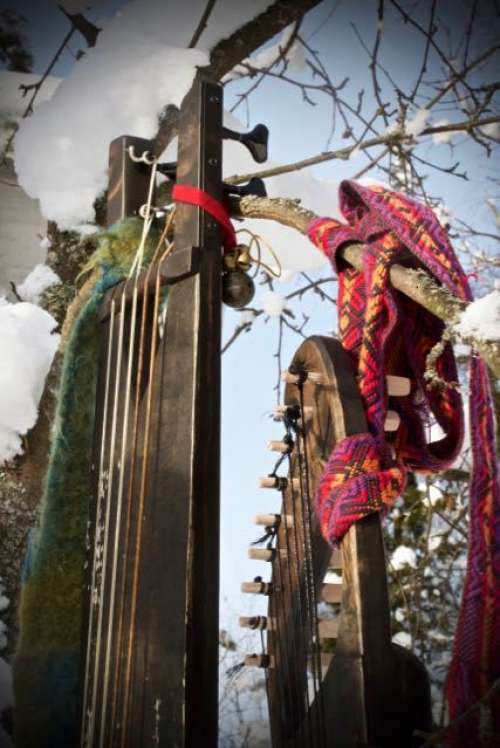 There are professional instrument builders in Finland, and kantele players have the luxury of being able to call a builder directly and commission exactly the sort of instrument they want, or they can collaborate in developing instruments. 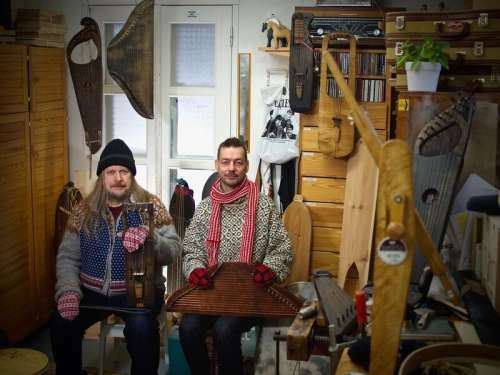 Rauno Nieminen and Timo Väänänen, kantele and lyre players of the Ontrei duo. Timo Väänänen counts himself lucky, because instruments have been available in Finland both when he was studying and when he began his professional career. He did not originally plan to explore instruments of other cultures related to the kantele, but life chose otherwise: today, Väänänen often travels with a lyre-kantele from Novgorod and a pyngyr and a nars-juh from Siberia. Väänänen has gone on ten field trips to kantele-playing peoples and has written two books and is working on a third. He eagerly awaits his next trip, which should take him to a Tatar village in the Volga region where there is still a living tradition of playing the göslä – yet another kantele.